Petroleum is one of the main sources of energy in the World. Petroleum and its by-products are used to fuel various forms of transportation, industry and domestic electricity use. Petroleum is also used to manufacture plastics which provides products essential for daily life. Also, petroleum has helped create many products like cosmetics, tyres (rubber) pesticides etc. Over the years there has been increased concerns over the environmental effects of the petroleum industry. The environmental impacts of petroleum are mainly negative. This is due to the toxicity of petroleum which contributes to air pollution, acid rain, and various illnesses in humans. Petroleum also fuels climate change, due to the increased greenhouse gas emissions in its extraction, refinement, transport and consumption phases. Petroleum is a complex mixture of many components . These components include straight chained , branched , cyclic , monocyclic aromatic and polycyclic aromatic hydrocarbons. The toxicity of oils can be understood using the toxic potential or the toxicity of each individual component of oil at the water solubility of that component. There are many methods that can be used to measure the toxicity of crude oil and other petroleum related products. Certain studies analyzing levels of toxicity can use the target lipid model or colorimetric analysis using colored-dyes in order to assess toxicity and biodegradability. Different oils and petroleum related products have different levels of toxicity. Levels of toxicity are influenced by many factors such as weathering , solubility , as well as chemical properties such as persistence. Increased weathering tends to decrease levels of toxicity as more soluble and lower molecular weight substances are removed. Highly soluble substances tend to have higher levels of toxicity than substances that are not very soluble in water. Generally oils that have longer carbon chains and with more benzene rings have higher levels of toxicity. Benzene is the petroleum related product with the highest level of toxicity . Other substances other than benzene which are highly toxic are toluene, methylbenzene and xylenes (BETX). Substances with the lowest toxicity are crude oil and motor oil. Despite varying levels of toxicity amongst different variants of oil , all petroleum -derived products have adverse impacts on human health and the ecosystem. Examples of adverse effects are oil emulsions in digestive systems in certain mammals might result in decreased ability to digest nutrients that might lead to death of certain mammals. Further symptoms include capillary ruptures and hemorrhages. Ecosystem food chains can be affected due to a decrease in algae productivity therefore threatening certain species. Oil is "acutely lethal" to fish - that is, it kills fish quickly, at a concentration of 4000 parts per million (ppm) (0.4%). The toxicity of petroleum related products threaten human health. Many compounds found in oil are highly toxic and can cause cancer (carcinogenic) as well as other diseases. Studies in Taiwan link proximity to oil refineries to premature births. Crude oil and petroleum distillates cause birth defects. The combustion process of petroleum , coal , and wood is responsible for increased occurrence of acid rain. Combustion causes an increased amount of nitrous oxides , along with sulfur dioxide from the sulfur in the oil. These by products combine with water in the atmosphere to create acid rain. The increased concentrations of nitrates and other acidic substances have significant effects on the pH levels of rainfall. Data samples analyzed from the United States and Europe from the past 100 years and showed an increase in nitrous oxide emissions from combustion. The emissions were large enough to acidify the rainfall. The acid rain has adverse impacts on the larger ecosystem. For example acid rain can kill trees , acidified lakes and dead fish. Coral reefs are also destroyed from the acidified rainfall from acid rain. Acid rain also leads to the corrosion of machinery and structures (large amounts of capital) and to the slow destruction of archeological structures like the marble ruins of Rome and Greece. The combustion of petroleum causes an increased amount of carbon dioxide emissions as well as other greenhouse gases. The first study on the effects of carbon dioxide was studied by Swedish Nobel chemist Svante Arrhenius. His mathematical model showed that an increase of carbon dioxide results in an increase in surface temperatures , therefore both factors are correlated. The combustion of petroleum for transport , industrial and domestic use is one of the major forms of air pollution. The ultimate by-product of oil combustion is carbon dioxide , however there are other by-products such as carbon monoxide and nitrates. These by-products react with the atmosphere to produce ozone and other greenhouse gases. The increased pollution has consequences on global temperature . The atmosphere reflects 30% of the incoming longwave radiation back and keeps 70% of it for warmth. However , an increased carbon dioxide concentration in the atmosphere acts as a "blanket" to increased heat. Therefore , more longwave radiation is trapped in the atmosphere when there is a higher concentration of carbon dioxide and this trapping results in increased surface temperatures. IPCC (2007) states that the climate system will heat up by 3 degrees Celsius for a doubling of carbon dioxide . The warming of the temperatures will have massive impacts on rainfall patterns , retreat of glaciers , and the average sea levels. Major oil spills include , Lakeview Gusher, Gulf War oil spill, and the Deepwater Horizon oil spill. Spilt oil penetrates into the structure of the plumage of birds and the fur of mammals, reducing its insulating ability, and making them more vulnerable to temperature fluctuations and much less buoyant in the water. Cleanup and recovery from an oil spill is difficult and depends upon many factors, including the type of oil spilled, the temperature of the water (affecting evaporation and biodegradation), and the types of shorelines and beaches involved. Other factors influencing the rate of long-term contamination is the continuous inputs of petroleum residues and the rate at which the environment can clean itself Spills may take weeks, months or even years to clean up. Volatile organic compounds (VOCs) are gases or vapours emitted by various solids and liquids." Petroleum hydrocarbons such as gasoline, diesel, or jet fuel intruding into indoor spaces from underground storage tanks or brownfields threaten safety (e.g., explosive potential) and causes adverse health effects from inhalation. Waste oil is oil containing not only breakdown products but also impurities from use. Some examples of waste oil are used oils such as hydraulic oil, transmission oil, brake fluids, motor oil, crankcase oil, gear box oil and synthetic oil. Many of the same problems associated with natural petroleum exist with waste oil. 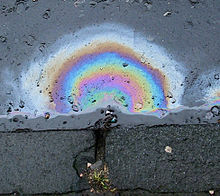 When waste oil from vehicles drips out engines over streets and roads, the oil travels into the water table bringing with it such toxins as benzene. This poisons both soil and drinking water. Runoff from storms carries waste oil into rivers and oceans, poisoning them as well. Many countries across the World have subsidies and policies designed to reduce the use of petroleum and fossil fuels. Examples include China which switched from providing subsidies for fossil fuels to providing subsidies for renewable energy. Other examples include Sweden which created laws which are designed to eventually phase out the use of petroleum , which is known as the 15-year plan. These policies have their benefits and their challenges and every country has had their different experiences. In China positive benefits were observed in the energy system due to higher renewable energy subsidies in three ways . It made consumption of energy cleaner due to moving for cleaner sources. Secondly , it helped increase the efficiency and third it resolved the issue of imbalanced distribution and consumption. However from the Chinese experience there were challenges observed. These challenges included economic challenges like initially lower economic benefits for subsidies from renewable energy than for oil. Other challenges included a high cost of research and development , uncertainty of cost and potentially high-risk investments. These factors make the development of renewable energy very dependent on government support. However aims of phasing out fossil fuels and petroleum use may also present economic benefits such as increased investment. This strategy may help achieve social goals for example reduction in pollution which might translate to better environmental and health outcomes. Another option for conserving energy and phasing out petroleum use is adopting new technologies in order to increase efficiency. This can include changing production methods and modes of transportation. Alternatives to petroleum can include using other “cleaner” energy sources such as renewable energy, natural gas or biodiesel. Some of the alternatives have their strengths and limitations that might impact on the possibility of adopting them in the future. Using corn-based ethanol might be an alternative to using petroleum. However, studies that concluded that corn-based ethanol uses less net energy do not factor in the co-products of production. Current corn-ethanol technologies are much less petroleum intensive than gasoline however have the GHG emission levels similar to gasoline. The literature is mainly unclear what the GHG emission changes would be by adopting corn-based ethanol for biodiesel. Some studies report a 20% increase in GHG emissions and some report a 32% decrease. However, the actual number might be a 13% decrease in GHG emissions which is not a significant decrease. The future of biodiesel might be adopting cellulose ethanol technology to produce biodiesel as that technology will contribute to a decrease in emissions. Renewable energy alternatives also exist. These include solar energy, wind energy, geothermal and hydroelectricity as well as other sources. These sources are said to have much lower emissions, and almost minimal secondary by products. The production of renewable energy is projected to grow in nearly every region in the World. Natural gas is also seen as a potential alternative to oil. Natural gas is much cleaner than oil in terms of emissions. However natural gas has its limitation in terms of mass production. For example, in order to switch from crude oil to natural gas there are technical and network changes that need to occur before the implementation can be complete. Two possible strategies are to first develop the end use technology first or second is to completely change the fuel infrastructure. Biomass is becoming a potential option as a substitute for petroleum. This is due to the increased environmental impacts of petroleum and the desire to reduce the use of petroleum. Potential substitutes include cellulose from fibrous plant materials as a substitute for oil-based products. Plastics can be created by cellulose instead of oil and plant fat can be substitutes for oil to fuel cars. In order for biomass to succeed there needs to be an integration of different technologies to different biomass feedstock in to produce different bio products. Incentives for biomass are a decrease of carbon dioxide , need for a new energy supply and need to revitalize rural areas. ^ a b c d Di Toro, Dominic M.; McGrath, Joy A.; Stubblefield, William A. (2007-01-01). "Predicting the toxicity of neat and weathered crude oil: Toxic potential and the toxicity of saturated mixtures". Environmental Toxicology and Chemistry. 26 (1): 24–36. doi:10.1897/06174r.1. ISSN 1552-8618. PMID 17269456. ^ a b c d e Montagnolli, Renato Nallin; Lopes, Paulo Renato Matos; Bidoia, Ederio Dino (2015-02-01). "Screening the Toxicity and Biodegradability of Petroleum Hydrocarbons by a Rapid Colorimetric Method". Archives of Environmental Contamination and Toxicology. 68 (2): 342–353. doi:10.1007/s00244-014-0112-9. ISSN 0090-4341. PMID 25537922. ^ Prasad, M. S.; Kumari, K. (1987). "Toxicity of Crude Oil to the Survival of the Fresh Water FishPuntius sophore (HAM.)". Acta Hydrochimica et Hydrobiologica. 15: 29–36. doi:10.1002/aheh.19870150106. ^ a b Lin, Meng-Chaio; Chiu, Hui-Fen; Yu, Hsin-Su; Tsai, Shang-Shyue; Cheng, Bi-Hua; Wu, Trong-Neng; Sung, Fung-Sung; Yang, Chun-Yuh (2001). "Increased Risk of Preterm Deliveries in Areas with Air Pollution From a Petroleum Refinery Plant in Taiwan". Journal of Toxicology and Environmental Health Part A. 64: 637–644. ^ "Petroleum Solvents Overview". www.burke-eisner.com. ^ a b Kirkeleit, J.; Riise, T.; Bråtveit, M.; Moen, B. E. (2005). "Benzene Exposure on a Crude Oil Production Vessel -- KIRKELEIT et al. 50 (2): 123 -- Annals of Occupational Hygiene". The Annals of Occupational Hygiene. 50 (2): 123–9. doi:10.1093/annhyg/mei065. PMID 16371415. Retrieved 2010-06-07. ^ "Benzene pollution - a health risk in Gulf BP Oil drilling disaster - La Leva di Archimede (ENG)". www.laleva.org. Retrieved 2010-06-07. ^ a b Tuccella, P.; Thomas, J. L.; Law, K. S.; Raut, J.-C.; Marelle, L.; Roiger, A.; Weinzierl, B.; Gon, H. A. C. Denier van der; Schlager, H. (2017-06-07). "Air pollution impacts due to petroleum extraction in the Norwegian Sea during the ACCESS aircraft campaign". Elem Sci Anth. 5: 25. doi:10.1525/elementa.124. ISSN 2325-1026. ^ Brimblecombe, P.; Stedman, D.H (1982). "Historic Evidence of Dramatic Increase in Nitrate Component of Acid Rain". Nature. 298: 460–463. ^ a b c Ramanathan, V.; Feng, Y. (2009). "Air pollution, greenhouse gases and climate change: Global and regional perspectives". Atmospheric Environment. 43 (1): 37–50. doi:10.1016/j.atmosenv.2008.09.063. ^ Nicodem, David E.; Fernandes, Conceicao; Guedes, Carmen L.B; Correa, Rodrigo J. (1997). "Photochemical processes and the environmental impact of petroleum spills". Biogeochemistry. 39: 121–138. 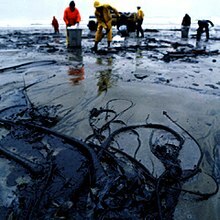 ^ "Hindsight and Foresight, 20 Years After the Exxon Valdez Spill". NOAA Ocean Media Center. 2010-03-16. Retrieved 2010-04-30. ^ HDOH. "Field Investigation of the Chemistry and Toxicity of TPH in Petroleum Vapors: Implications for Potential Vapor Intrusion Hazards". Hawai'i Department of Health. Retrieved 8 December 2012. ^ U.S.EPA (11 June 2015). "Vapor Intrusion". U.S.EPA. Retrieved 13 June 2015. ^ Ouyang, Xiaoling; Lin, Boqiang (2014). "Impacts of increasing renewable energy subsidies and phasing out fossil fuel subsidies in China". Renewable and Sustainable Energy Reviews. 37: 933–942. doi:10.1016/j.rser.2014.05.013. ^ a b Farrell, Alexander E.; Plevin, Richard J.; Turner, Brian T.; Jones, Andrew D.; O'Hare, Michael; Kammen, Daniel M. (2006). "Ethanol Can Contribute to Energy and Environmental Goals". Science. 311 (5760): 506–508. JSTOR 3843407. ^ Panwar, N.L. ; Kaushik, S.C.; Kothari, Surendra (2011). "Role of renewable energy sources in environmental protection: A review". Renewable and Sustainable Energy Reviews. 15 (3): 1513–1524. doi:10.1016/j.rser.2010.11.037. ^ Chong, Zheng Rong; Yang, She Hern Bryan; Babu, Ponnivalavan; Linga, Praveen; Li, Xiao-Sen (2016). "Review of natural gas hydrates as an energy resource: Prospects and challenges". Applied Energy. 162: 1633–1652. doi:10.1016/j.apenergy.2014.12.061. ^ Hekkert, Marko P.; Hendriks, Franka H.J.F. ; Faaij, Andre P.C. ; Neelis, Maarten L. (2005). "Natural gas as an alternative to crude oil in automotive fuel chains well-to-wheel analysis and transition strategy development". Energy Policy. 33 (5): 579–594. doi:10.1016/j.enpol.2003.08.018. ^ Cherubini, Francesco (2010). "The biorefinery concept: Using biomass instead of oil for producing energy and chemicals". Energy Conversion and Management. 51 (7): 1412–1421. doi:10.1016/j.enconman.2010.01.015. ^ Leson, Gero; Winer, Arthur (1991). "Bio filtration : An Innovative Air Pollution Control Technology for VOC emissions". Journal of Air and Waste Management Association. 41: 1045–1054.